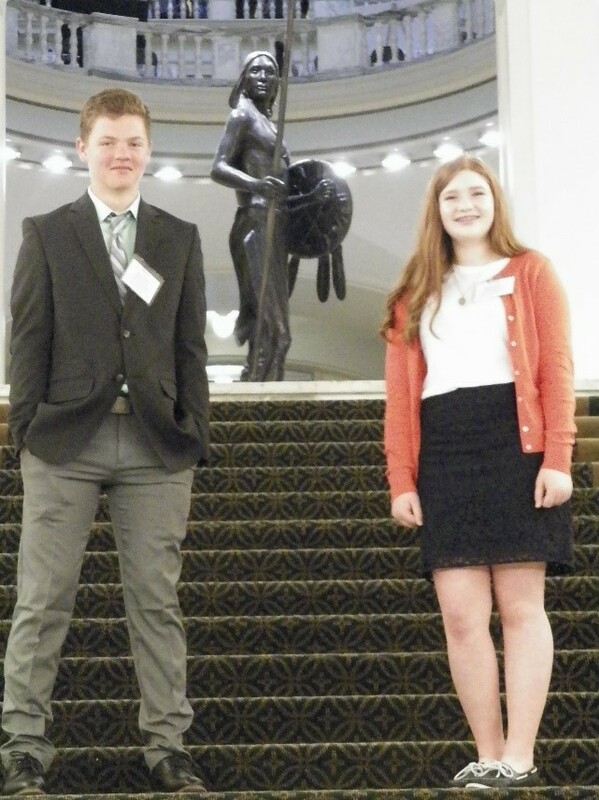 8th graders across the state of Oklahoma entered the Annual “If I Were Mayor…” Contest, sponsored by The Mayors Council of Oklahoma and the Oklahoma Municipal League. There are three finalists chosen from the contest entries. All of Calumet’s 8th graders entered the contest, and two 8th graders won the statewide contest. Dacus Cooper won 1st and received a monetary prize of $250.00, while Audrey Gathers won 3rd place and received a monetary prize of $100.00. These 8th graders traveled to the State Capitol, Tuesday, March 27, 2018, where they read their essays and were presented with certificates, a citation of Congratulations from Senator Lonnie Paxton and Representative Harold Wright, and a check. These students met mayors from all over the state of Oklahoma, along with several state representatives and senators. Congratulations Dacus and Audrey!